Brazilians take sport very seriously. Not withstanding that obesity is becoming more and more of a problem, sport is an important part of social life. In terms of equipment, Brazilians only know two kinds: none or full battle. So either you see a guy in flip-flops and a t-shirt make a few push-ups or you see a woman with super-duper fancy running shoes, drinking bottle, iPod clip, a support bra and the most psychedelic leggings witnessed in human history. Actually, leggins with visually nauseating color-pattern combinations are as omnipresent as outrageously ugly. It still defies my imagination as to why anybody would voluntarily subject herself to wear such a piece of clothing. Be this as it may, in the late afternoon and early evenings, it’s time for the mass movement. Outside the big cities, people will walk along the road, before hitting the public gym. Inside the cities, any park – or if available: the beach – will be a popular spot to finish the day with a few exercises and a neighborly chat. Differentiation is in business terms defined as making your product or service different from others, to make it more attractive to whoever it is you want to sell it to. Brazilian shops are a great example how not to do it. When driving through the villages of the Brazilian hinterland, we often see all kinds of artisan products on sale: wooden kitchen ware, straw hats, puppets or clothes, stone pots, etc. However, in any given village, you only see one of its kind, e.g. 5 small shops with carefully laid out wooden kitchen ware – all in exactly the same style, from the same material, for the same price. Another example are the Tapioca stands on the beach. Tapioca is a regional specialty; a kind of pancake made from manioc flour filled with coconut, cheese and other stuff. It seems to be an unwritten law, that there can never be just one Tapioca stand. No, there have to be four if not five stands, one next to the other, selling the same food, for the same price and with the same slow service. Even in the city centers, it is not rare to find clusters of shops all selling identical products. On the contrary, some streets are known for having dozens of bike shops, car repairs, furniture or household appliances shops. At least there, it comes to the advantage of the customer: With only a little bit of negotiation skills, it is possible to get a really good bargain. In the advent season, most shops hire additional assistants to service as many customers as possible. However, when no customer happens to be in the shop, all the assistants can do is stand around. All 10 or 12 or even more of them in an empty shop. Somehow I cannot refrain from imagining that – should a solitary customer wander into the shop – it would be very easy for these assistants to seize the customer and hold her down till she obliges to buy something. Needless to say that I avoid most shopping besides groceries in the pre-Christmas times in Brazil. If you are up for some ‘browsing’, i.e. strolling through the shops just to look around, shopping – if you want to call it that way – can be rather tedious a less than enjoyable experience. If you actually need something & would like to try a bunch of different products, you have come however to the right place. What the difference makes: the shop assistants in their sheer number. Let me explain. Where any given shoe shop in Europe would have 2 employees – one in the shop, one at the cash register, the Brazilian pendant will have up to 10 employees. 7 of these will be getting any shoe the customer would want to try from the inventory, 2 will be at the cash register and the last one the supervisor. Of course, all these people need to be kept busy which greatly alters the whole shopping experience. Back in Europe, you’d pick a shoe you like & search among the boxes to see if you’re lucky enough to find your size, try it & put it back, and repeat this process until you find something fitting your feet, taste & budget. In the case that this endeavor is not accomplished successfully, you give a polite nod to the chap behind the register, leave the shop and are done. In Brazil, you’ll only get to look at the shoes which are exposed safely behind glass & point at anything you can fancy trying. The shop assistant, after briefly inquiring after your shoe size, will fetch all of them & bring them to the chair on which you’ve settled in the meantime. If after some back & forth (of the shop assistant, of course), you’ve actually founds something you like & want to purchase; the first thing you get is a piece of paper. With that you pay at the register – a separate process that may take as much time as the preceding selection one – and only then obtain the box with your product of choice from the assistant that has been taken care of you. More often than not, the assistant will give you her/his card and it’s only decent to come back to the same person if the service was good. Many of the assistants are paid partly by the turnover they make. This process happens in similar forms in most household appliance shops, cutlery, household linen, and even some for clothes. So far the short description of completing a transaction successfully. If – IF – however, you have not found anything particularly appealing or fitting, you face the slightly awkward feeling of having wasted someones time. At least, that happens frequently to me in those moments. Also, simply ‘browsing’ becomes a tad tiresome to me as I’m constantly offered help while I’d much rather be left alone. Obviously, I’m complaining on a very high level here. But I also wonder if it is just me that feels a bit uncomfortable. Or could it be that, in Europe, we are not used to a somewhat pampering customer service any longer and that I should enjoy it while I’m here? Well, not the day but the hour to take out the dog or the kids. More precisely, it’s the time before sunset – after the heat has reached its peak and before its getting dark. Which means, depending on the season and latitude*, between 16:00-17:00 or 19:00-20:00 in the afternoon / evening. It’s the time of small dogs, small children, the nannies, pensioners and those being idle; the time for a meeting, some gossiping, and letting the little ones run free; the kids that is – not the dogs. 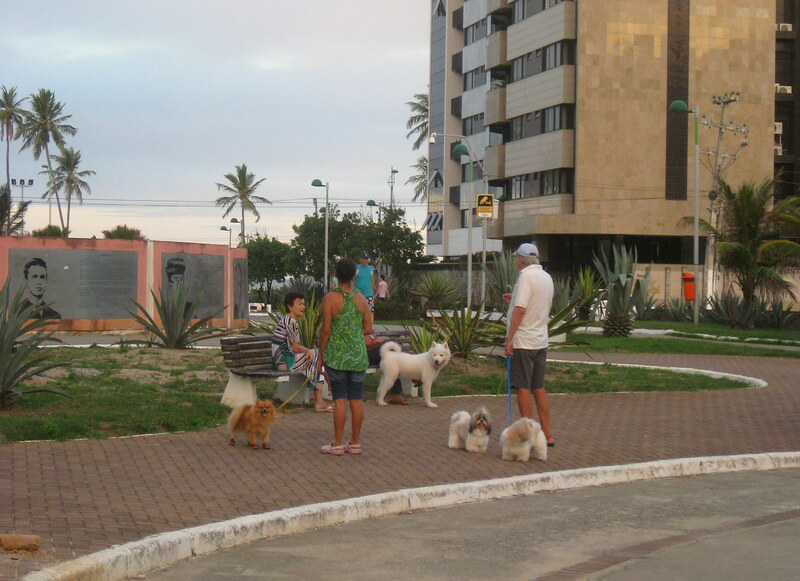 Other countries may have their pensioners’ club or the playground, in Brazil people meet simply at the next big square or park close by. 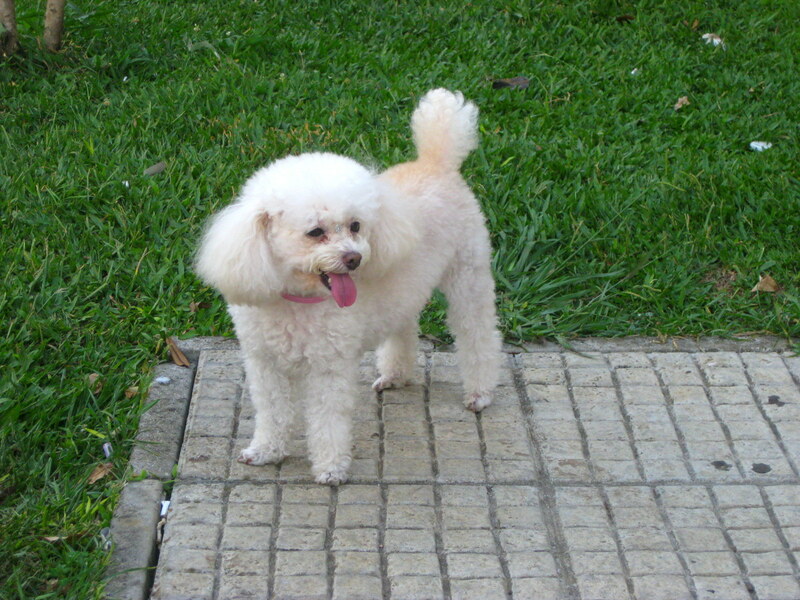 During these get-togethers, the dogs and children are mostly cared for by a domestic worker, the endangered status symbol of the Brazilian upper class. Both the children and the dogs fulfill during this time a more social purpose: provide something to be talked about. The dogs generally excel at this task since they don’t appear to be overly well trained. Which is not a problem since most of them are of the variety Fusshupe**, i.e. it barks and yelps a lot, but can be lifted or pulled in any direction thanks to its inferior mass and therefore resistance. Even with the children, one does not notice an undue degree of educational care. It needs to be said however that Brazilians in general show an incredible patience and benevolence to children of (almost) any age. That the level of noise considered acceptable is far higher than in most European countries, is probably not entirely irrelevant in this context. * Brazil is huge. Really. It reaches from the 6th degree northern latitude to the 34th south, i.e. more than 4300 km in total. The east-west extent is almost as large. In other words: the European Union fits in nicely.